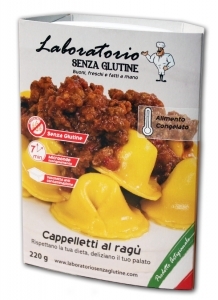 Cappelletti al ragù, a typical italian recipe, are handmade with natural gluten free flour and no preservative. This ready-made first dish can be cooked in a couple of minutes in the microwave, without remove it from its packaging, in order to avoid contamination risk. Meat sauce 32% (tomato puree, beef, extra virgin olive oil, carrot, onion, red wine), casatella cheese 14% (pasteurized cow’s milk, rennet, milk enzymes, salt), ricotta cheese 9% (buttermilk, salt, acidity regulator, citric acid, lactic acid), Parmigiano cheese 5% (cow’s milk, salt, rennet, preservative), rice flour, potato starch, sunflower oil, guar flour (E412).